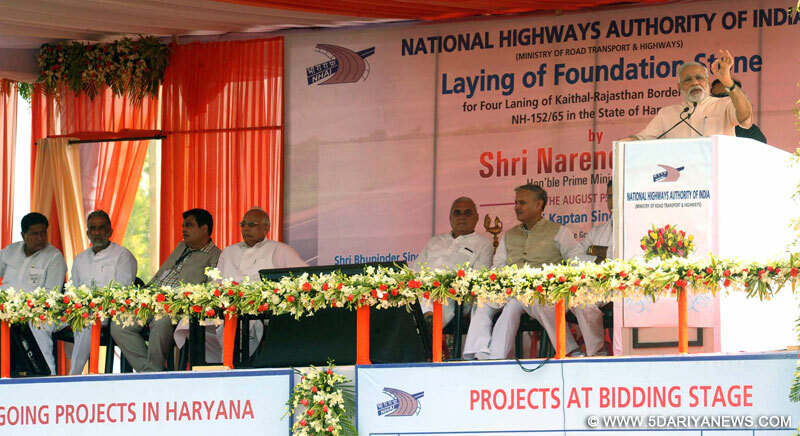 The Prime Minister, Narendra Modi addressing after laying the foundation stone for the four-laning of "Kaithal-Narwana-Hisar-Rajasthan Border" Highway, at Kaithal, in Haryana on August 19, 2014. Prime Minister Narendra Modi said here Tuesday that a nation which gives impetus to infrastructure is more likely to become developed. "When the road network increases, the avenues of development increase too," Modi said at a public gathering in Kaithal here.He added infrastructure should be modernised in keeping with the new century. "We cannot do with infrastructure of the last century. Any contractor comes, makes a road and it gets destroyed in monsoon. This won't do," Modi said. He said the number of people at the rally showed the importance of development in the lives of people.Modi said he has "come from the land where Swami Dayanand Saraswati was born".Saraswati was born Feb 12, 1824 in Tankara, near Morbi in the Kathiawad region (now Rajkot district of Gujarat). "He (Saraswati) is widely respected in Haryana," Modi said, assuring the crowd that he will give back the love he got from the people of Haryana by speeding up development there.